Secret agents, murders, thrilling chases and a pencil moustache. I’ve always been fascinated with the world of theatre and the performing arts. As someone with the memory of a goldfish, I’m constantly in awe of those who can act. Being able to memorise lines and deliver them in a realistic and believable way is –to my mind, something truly amazing, and a complete joy to watch. 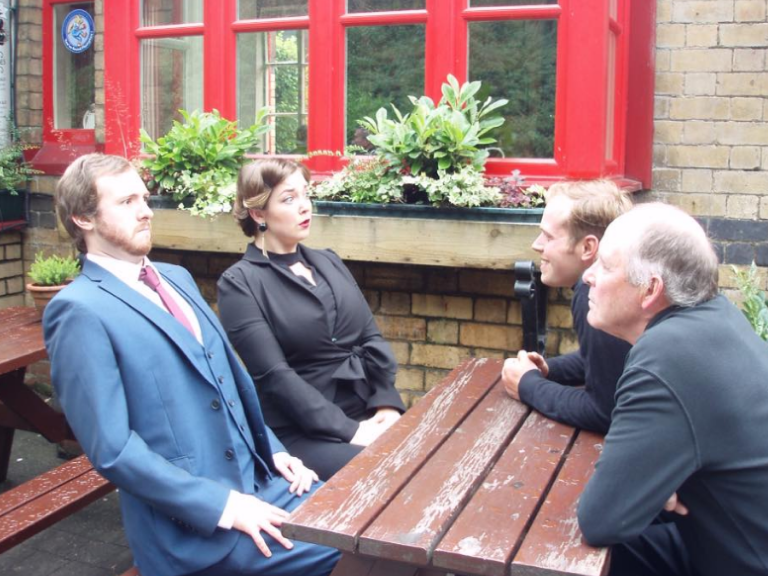 Earlier in the year I was fortunate enough to be invited along to a rehearsal of Ulverston Outsiders production of Bedroom Farce – an experience that I absolutely loved! So I was delighted to be invited back to the Quaker Barn in Ulverston last week for a full run through of The Outsiders latest (and brilliant) production – The 39 Steps. The 39 Steps is a parody of the 1915 John Buchan Novel and 1935 Hitchcock film of the same name. This production is directed by Tony Smith who kindly introduced me to the cast and gave me a quick summary of the play before rehearsals began. Hannay decides on a trip to the theatre. Whilst watching a performance by Mr Memory, shots are fired and Hannay finds himself back at his flat with the mysterious femme fatale Annabella Schmidt She explains she’s a spy and is trying to stop secrets leaving the country. Shortly after she staggers into Hannay’s bedroom with a knife between her shoulder blades and so begins a thrilling chase involving spies, the Forth Bridge, false identities, the London Palladium, the mysterious 39 steps and plenty of laugh out loud moments courtesy of the fabulous Outsiders cast. The original concept and production of a four-actor version of the story was by Simon Corble and Nobby Dimon. Patrick Barlow rewrote this adaptation in 2005. Although this play has traditionally been performed by just 4 actors taking on all the roles in the play, The Ulverston Outsiders has around 30 members and wanted to include those who wanted to be involved, so this production has 14 actors – still with many of them playing more than one role. The excellent Hanna Fishwick plays all 3 leading lady roles, and does a great job of transitioning roles (and accents) throughout the play. The ever impressive Rob O’Hara and Adam Atkinson play the clowns jumping from role to role – from salesmen, heavies, Policemen and pilots. This works so well and is incredibly funny. Their timing is impeccable. And Paul Jordin turns in a brilliant performance as both Mr Memory and the Crofter, just how he remembers all the lines he has I’ll never know. The laughs and impressive performances aren’t just reserved for the main characters. The supporting cast all provide moments of brilliance and deliver more than their fair share of laughs and expertly delivered lines. For a rehearsal like this, quite a lot has to be left to the imagination in terms of props and set design, the cast have a few tables, chairs and props to work with - but there was enough to set the scene and left me intrigued to how it’s all going to come together when the play opens at The Coronation Hall on Tuesday 20th November. The whole rehearsal was fabulous, plenty of laugh out loud moments, great characters, and a fast paced storyline delivering a terrific show. I loved it, and if it wasn’t for one or two of the actors saying that they’d missed a line, or delivered a wrong word or two I wouldn’t have noticed, I was too engrossed in the performance. The 39 Steps is a perfect antidote to the miserable weather we’ve been having, so cheer yourself up and make sure you head over to The Coronation Hall to witness it. We will, and we can’t wait. 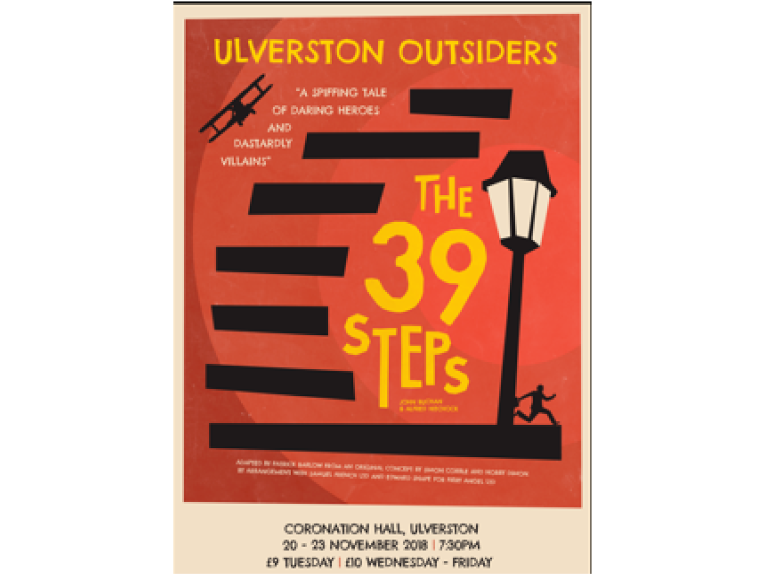 Ulverston Outsiders production of The 39 Steps opens on Tuesday 20th November and runs till Friday 23rd November.